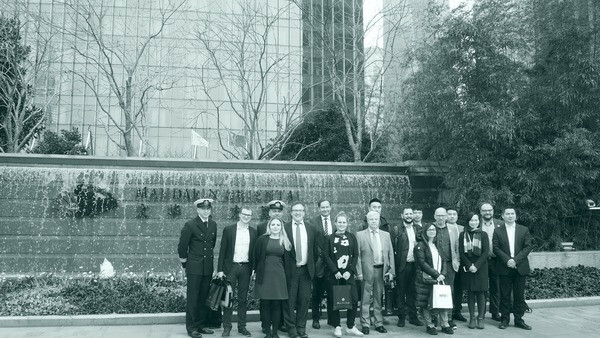 Last week the Baltic Ports Organization (BPO) travelled to Shanghai, China, to take part in two events relevant to the development of the global LNG market. 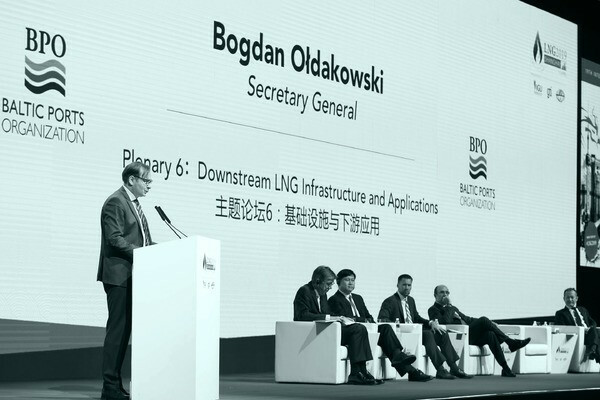 Speaking at the Shanghai Maritime University and at the LNG2019 conference over the course of 3-4 April 2019, the BPO was part of the delegation representing the Go LNG project. The trip was a part of a joint mission by several Go LNG project partners, including the BPO, aimed at sharing the best practices and experiences with LNG with foreign stakeholders. One of the project’s main goals is to look into possibilities allowing for existing LNG infrastructure to be utilized by all LNG users, thus lowering its, currently high, impact on pricing. With global demand for LNG on the rise, the knowledge gathered by Baltic stakeholders can be of important value for their peers in other regions all over the world. The project’s stand at the LNG 2019 Shanghai – the 19th International Conference & Exhibition on Liquefied Natural Gas enjoyed high interest from the event’s participants. BPO’s address at the workshop “LNG as Future Marine Fuel: Trends and Challenges”, held at the Shanghai Maritime University and organized by the World Maritime University, focused, among other topics, on illustrating the experience Baltic ports accumulated while preparing for the implementation of LNG bunkering services. The drive to make LNG as accessible as possible, a response to increasingly strict environmental regulations in the Baltic Sea region (e.g. SECA, NECA), was supported by two BPO-led projects – “LNG in Baltic Sea Ports I&II”. It resulted in a growing network of ports offering the possibility of small-scale LNG bunkering, a process still active and now moving into its next phase, the creation of an LNG bunkering fleet, which is already underway. The workshop provided the BPO with a unique chance to exchange best practices and views with Chinese companies (i.e. COSCO), maritime administration representatives and members of the academia. LNG2019, the biggest LNG event in the world, saw its debut on Chinese soil this year. The conference’s history reaches as far as 50 years into the past and offers its attendees unrivalled networking opportunities. Over 10.000 delegates and 240 international speakers participated in the event. The BPO took part in the panel centred around downstream LNG infrastructure and applications, with some key points including the role LNG plays in the development of distributed energy systems, infrastructure cost reduction possibilities and their importance for developing markets, LNG’s growing potential as a transportation fuel, as well as the future of small-scale LNG. “We have seen more and more interest in Baltic experience when it comes to the bunkering of LNG. The Asian LNG market is huge, with China soon to become the world’s biggest LNG importer. Due to this development, LNG’s use as a marine fuel in Asia will grow. We are glad to share the Baltic approach to the promotion of LNG and the best practices centred around our ports’ preparation for the introduction of LNG bunkering services”. It is evident that the Baltic region is experiencing rapid growth, additionally underlined by a growing LNG bunkering fleet. Skangas’ Coralius, an LNG feeder, and carrier, has been in operation since June 2017, and the end of 2018 saw Nauticor’s Kairos, an LNG bunker supply vessel, enter service further improving LNG availability in the region. The year 2020 will see the next bunkering vessel start its operations, on order by Eesti Gaas. BSR’s success with LNG can be attributed to the region’s greatest strength, namely the willingness of different stakeholders to work together in order to realize even the most ambitious of goals. This aspect is also reflected in the aforementioned Go LNG project’s goal to establish a BSR LNG Business Cluster, aimed at helping both the transport and marine technology industries to become more competitive by creating a hub for clean shipping, competence and tech development. More information about the Go LNG project is available here.